Wildfires in Tenerife hit the island between 30th of July and 3rd. of August 2007 real bad. A Finca which may also be a rural house with a small patch of land around has become very popular as a holiday home in Tenerife. More about fincas and wildfires, later. None of them which were big estates and island attractions were in the fire hazard zone, though. When did the Tenerife fires get under control? Until the 4th day after the outbreak I had to answer that they were not. Everything depends on southwesterly winds. Those funnel the wildfires in Tenerife into the mountains. Winds are usually stronger in the early hours of the morning. I know, because, that's when I sleep better. They said that Tenerife had never seen fires of such magnitude. However, my bakery people remember a strong field fire in Tenerife in 1983. How fast will Canary pines recover? My friend Lourdes told me that endemic pines which were devastated by wildfires in Tenerife took almost 10 years to recover. to reach their former glory and, respectable height. might not have seen fire. They are in a spot by Paisaje Lunar or Lunar Landscape. This picture serves merely the purpose to show you in what rare grounds those trees are able to grow. The incredible photo speaks for itself? Doesn't it? I better give credit to César F.Real Real. Speed of wildfires of 2007? Let`s not rely on those numbers. What counts is that huge parts of the island's forests were ravished by flames. How much forest destroyed, how many endangered people in 2007? Due to a great panic in the population it was easy to get confused estimating numbers. Who could blame the people? The photo above shows the region of Los Realejos Alto (Alto = Upper). You only see some of the area to the left of this town of 35 000 inhabitants (I would say the figures are much higher with so many flat blocks built there recently). Mind, it was once bigger than Puerto de la Cruz with its numerous tourism employees. 'El Puerto' had 60 000 residents in 2007. Coming to think of it that meant wildfire in Tenerife threat to about 100 000 or more people in this former Taoro region. Plus, you don't see the lands of Los Realejos that would be found to the right of the picture. Its farmsteads (fincas) and, many holiday homes were top vulnerable for the recent wildfires in Tenerife. The region Los Realejos is big because there is also the lower Los Realejos where I stay. Los Realejos Bajo is near Tigaiga. What about fires in the Realejos district? Wildfires had been reported in Los Realejos on the day when even the lower parts were full of fire smog. Mind, please the large valley of La Orotava with all its fincas by the forests. You would find La Orotava Valley to the left of the photo behind that black mount you can make out. What do you think? Can you visualize wildfires in Tenerife, there? Los Realejos had wildfire flames already. I will show you the next section that will follow on the left just now. Now you may discover a small spot on this photo where the Valley de la Orotava is all lit up by sun. The rest is almost dark towards the coast. Just figure that the wildfires were given a chance to travel all those mountain forests towards the left. They would have easily entered La Victoria, Santa Ursula and, then the farm areas of El Sauzal/Tacoronte with its vineyards and, all the rest. It would have been disastrous for the island. The wildfires would have made it fast and furiously into the whole North. The wildfires would have devastated the Anaga farm lands and the magnificent Mercedes Forests with its Laurisilva. The authorities of Los Realejos which are very efficient worked feverishly. They put out the fire that had been planted in different spots. They also helped in La Guancha. That village is right at the end of Realejos farmlands . The people in charge of Los Realelejos are to be congratulated for their superb efforts and, work achieved. All I could observe then was that my beautiful view in lower Toscal Longuera right next to Puerto de la Cruz was gone. In the morning of Tuesday first of August 2007, I couldn't smell the fires in Tenerife. In the afternoon the air was heavy with it. People with breathing problems would indeed suffer very much. Hospitals and Centros de Salud (kind of branches for hospitals for emergency for example)were very busy because of the fires. The worst is indeed the smoke of great fires. It stings your eyes, prevents breathing and, blocks the lungs. The sky in all mountainous distances seen from my balcony was one big gray front. That could also have been caused by fire breaks put up by panicking people and, fire prevention experts to prevent the bush fire in Tenerife from spreading. Who could blame them? Even Punta del Sol was covered in fire fog. Everybody was fearing new powerful winds from the ocean to cause the wildfires in Tenerife to take over new areas. Mind, many little farms and houses are to be found too close to the tree belt. I already had not liked this when I saw the first Tenerife farmsteadt on sale in our agenda. What about the mist belt? Normally, the mist belt on slopes would protect against winds also. But, during the time of the fire onslaught no mist was there. All that was rather unusual for northern Tenerife. Tenerife which normally had no water problem before the fire drama would have to face one. I don´t remember if they said it in the Radio or in television that people should use only the bare minimum of water due to the outbreak of the wildfires in Tenerife. 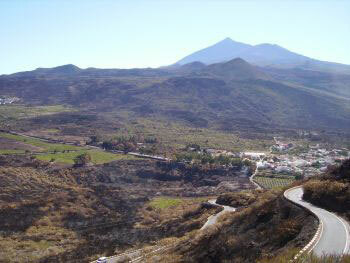 You may see the Valle de Arriba burned by fires just below Mount Teide, in this picture. Please compare the next photo of the same area with this one. 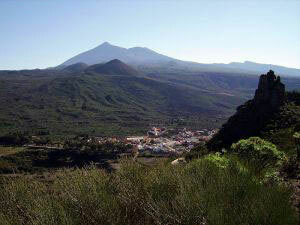 To protect the area of the Cañadas del Teide from the raging bush fires was just about impossible. There are not enough access points to draw water in all higher altitudes. Public water fountains are normally much further down the mountain slopes. People were not only worried that the wildfires in Tenerife might destroy all Tenerife Canary pine forests. They also were scared that the famous laurel forests might be in danger. Not to forget all the mountainous villages where people faced danger of life. Thinking of the beautiful little Masca which is right in the middle of the danger zone of the fires made me shudder. The fires were in the Valle de Arriba but, also in the Guia de Isora area. It would be easy for the flames to get over from there to Masca. The photo by César Francisco Real Real is showing only a few farmsteads (fincas) in this mountainous valley called Valle de Arriba (valley on top) district Santiago del Teide. Much financial fire damage was reported there. dwellings were destroyed which we may see here. Perhaps, I will receive a photographic update. Help was coming from that island which seemed to have overcome the worst danger. Problem being is that the island is not equipped to fight wildfires in Tenerife in such extent. Tenerife has far too few planes and manpower for fire fighting. Some old man in my road told me that. It makes sense because if there are more such planes, then they must be on mainland Spain. The Canaries that are right opposite Mauritania on the West Coast of Africa with (Tenerife to Africa 200 miles) never had to worry about military planes which they could use now for fire fighting. However, many locals had signed up in this particular case. They all wanted to help fight the wildfires in Tenerife. My young IT was one of them. I had talks with my local friends. We were all asking why Mainland Spain was not sending more equipment and planes over to fight the escalating wildfires in Tenerife. May be helicopters cannot cover such a large distance over the ocean. But, motherland Spain surely had military planes. People in Canary television were also asking why the military had not been employed yet. Only later, when the fires on Gran Canaria that stroke first were mostly under control a plane was sent to Tenerife that could fight the flames with "chemicals". Soldiers came over to help at that stage, also. The fires in Tenerife were also rather only in forest areas or in farm districts that border such areas. All directly threatened people had been evacuated in both Canary Islands to local safe places. Buses were partly used for it. My latest evening news 01.08.2007 on the wildfires in Tenerife were from Radio Los Realejos. Now, it said that 20,000 hectares of land have been damaged by fire. The figure for Gran Canaria was 15,000. A third of the forests of Tenerife and Gran Canaria combined were said to have burned. 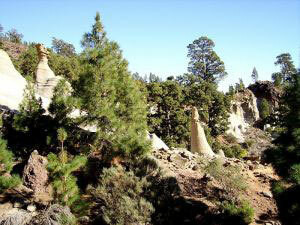 People, here in Tenerife, were, however, surprised that some mountainous forest pockets had not burned at all. Perhaps the winds passed them by. It's also possible that fire ladders could have been put up to prevent to get at pine trees above. When you chop off all lower branches you create a fire ladder. Was Gran Canaria Arson to blame? There was strong evidence that fires in Gran Canaria were planted by a forest employee. They said it in the Spanish radio channels, they repeated it in Spanish TV and in Spanish newspapers. It had to be true. The man admitted to have committed arson in the forests for fear of loosing his job in September. He was apprehended without bail. The fires, of course, escalated into wildfires in Tenerife due to extreme heat and strong winds which we had, then. As far as I am looking back, August has usually been a month with little wind. It´s the only time of the year where Puerto de la Cruz may get a bit sticky. What about military planes a friend had asked me? I believe that helicopters can´t be used with wildfires in Tenerife when winds as well as fires are too strong. But, other planes may throw down "chemicals" from higher up as shown in Greece. In news on Greece fires it was said that Greece asked Russia for help to fight its fires. Russia, promptly sent a military plane for that purpose. I find that amazing and very positive. By the looks of it the "Big Bear" acted like a true European brother. The Canary television channel reported on Wednesday 2nd of August that the big fire danger in Gran Canaria was over. Tenerife was also in a better situation by then. As from Tuesday night it had been reported in my local Spanish radio channel that the remaining bush fires may be controllable in Tenerife. A slightly changed weather condition had truly occurred. I could even feel a faint drizzle during the early morning hours on Wednesday 4th of August when the situation was declared as much better. I am living in the Northern parts of the island in Los Realejos right next to Puerto de la Cruz. Masca's nature may be seen as fire prone to an extent. It was hit hard but recovered. Much later, I learned from the owner of Masca's big curio shop that many of his buildings burned down and insurance didn't even compensate for the damage. Beside is a photo of the picturesque high mountain village of Mazca in Tenerife before the wildfires in Tenerife in August 2007. 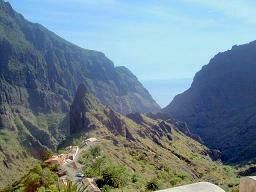 Masca is in the one of oldest Tenerife mountains near Santiago de Teide which lends its name to the whole district. Masca has some typical Canary houses where Tenerife crafts abound. I am hoping that some of all of this could be saved, at least. What matters more is, of course, that no people were harmed by the wildfires in Tenerife. However, mind that consequent landslides of corroded land may be fatal with heavy rain. 100 people perished in for that reason in Garachico in 1646. By the way, foreigners don't really own property in Masca but exceptions confirm the rule. I could see in television that more modern buildings in Masca seemed to be unharmed. Later, I heard that 4 older houses in Masca burned to cinders. Apparently the bodega with the rustic old timber beams was destroyed. That was my favorite in Masca. See Tenerife 2007 fire aftermath scenes... They were captured at several stages. Use some of the pictures to perceive and deal with the tragedy from an artistic perspective which may also reveal beauty and poetry by way of thinking positively. Guía de Isora and Valle de Arriba which would be found to the east of Los Gigantes, real close to forests was hurt by flames, also. Los Gigantes a popular paradise of the holiday home in Tenerife was spared by fires. All about Can you see on the photo behind the building on the right how close vegetation gets to the town of Garrachico To make it worse is that it comes straight down from the forests. Any wildfires in Tenerife from higher up will be hard to keep off the small town. Note that Garachico mudslides because of previous fires caused 100 human death and destroyed 40 boats in 1646. Also, I am asking why global disasters with wildfires only being one example can't be fought early enough. That is only my humble self having such thoughts. Slow action without strategic means is incomprehensible for me. There sure must be experts who could combine efforts to work out proper plans that may be carried out. I know that natural disasters can't be stopped. But perhaps, much could be done that some misfortunes will not escalate so much. After all, we are living in modern times with cell phones as well as email working at least in most disaster cases, at the start. A Tenerife farmer whom I know works now for the Cabildo of Tenerife half days. His job is to prune pines and laurels by the Monte, as he puts it. Locals say Monte (mountain or mount) when they mean the forests by Teide. The pruning is part of environmental management to protect the upper parts of trees and the entire forests a little against fires. Practical educating about the Tenerife environment by government as well as towns is very much geared towards its nature by Mount Teide with all its endangered species. Also, more and more warning signs, billboards as well as reminders, as not to litter, are now found in wildfires in Tenerife prone wildlife habitat which are part of environmental awareness campaigns. There is a new law which implies a prison sentence from six to nine years for arson which causes wildfires in Spain. Nine years of prison expect those who commit arson to national parks. This is the same penalty like for harming valuable environment. Unemployment is no excuse for creating work by putting a match or the like to forests. See plenty valid points which are certainly proof that this happened at Palo Blanco Realejos with Tenerife fires on August 14 of 2012. Icod de los Vinos engulfed by flames? Many a holiday home in Tenerife is found around Icod de los Vinos, especially outside of town where the trouble of the fire hit. Tenerife El Tanque is generally not taken for a holiday home resort. This place is also near forests. El Tanque has apparently been in high danger by the wildfires in Tenerife. A friend with a baby who lives there saw high flames near her house. It was spared. Luck may also be a factor, as all depends on winds as well. That's what my friend said. The phone line was working, because that's how I know about it. By the way, this friend had bought her little house as a holiday home in Tenerife. Later, she had decided to settle on the island. She had not thought about the danger of wildfires in Tenerife. All upper areas in the Teno mountain range(785 square miles) which includes Valle de Arriba (district Santiago del Teide) were in the wildfires in Tenerife zone. That means upper areas of los Silos and Buena Vista del Norte. Buena Vistas' well known golf courses are of course not in highlands. Bush fires came up quite late above San Juan de la Rambla near la Guancha. Mountain slopes of Los Realejos were revealing fires in different areas. It was said that it burned there heavily in Fortaleza. The flames were appearing at the same time. Boy oh boy, I could smell the fires in Los Realejos for a whole day, then. The hospitals must have almost burst with people with respiratory problems. Was that arson that caused wildfires in Tenerife near Los Realejos or perhaps in the whole island? Radio Realejos reported that the authorities think that the fires were arson. Last not least, forest patrols as well as investigations on the matter of bush fires in Tenerife were scheduled right up to October. Later, a youth who didn't work in the forests had been apprehended. Wildfires in Tenerife also surged in the Tacoronte area on Tuesday afternoon. Or was it on Monday? I could actually see the area from my balcony. There is precisely one point that is called Punta del Sol (Sun Point) There is always sun there. But on that afternoon beginning of August it was pitch black. I would think that tourists that had a short holiday home in the Parador (rural, government owned hotel) in the Cañadas del Teide as well as in the log cabin near the Teide were evacuated. However, I don´t understand the general statement in the media about evacuations from camping grounds and hotels because of the wildfires in Tenerife. Why? There are not really any hotels in forests in Tenerife. Tenerife is not like Switzerland or like the South of Germany in that respect. I am also wondering very much which camping grounds are in mind. So far I have only found two such sites. One in the south of the island and one by Punta de Hidalgo in the very north. Wildfires in Tenerife hit agriculture badly. One could really see so in television. Many a small farmer suffered financial loss. So many of the people interviewed were crying at the end. Destroyed livestock like granaries and, other is a different financial matter. They were showing burned electric and electronic machines and, devastated farm equipment as well.. I was hoping that the loss of the Gran Canaria toucans in the Palmitos Park zoological garden were less than it looked like. They were saying in the television channel for all Canary Islands that 150 bird species had been harmed. One of my neighbor's dad who lives in a mountain village had lost his dog due to the wildfires in Tenerife. May be he forgot to take him off the chain in time. He didn't lose his goats, though. Tenerife and Gran Canaria was working hard to bring back infrastructure for partly destroyed water, electricity and, telephone supply. A friend of mine had a problem with her broadband. She was told by the national telephone company that this was due to the Tenerife fires. I couldn't believe that. My friend's telephone connection worked, you know. She doesn't live in any of the danger zones. Fincas (farmsteads) on my island were the worst hit by wildfires in Tenerife. This is what my IT who was helping fight the fires also told me. The situation in Gran Canaria seemed a bit different. Television was showing devastated farms as well as urban areas if I was not mistaken. Some buildings looked very badly affected by the fires. In one news-page in the Internet it was said that local authorities estimated a damage of EU 3000 ($4000)per fire hit family. I am not the brightest person in mathematics. So, how can 100 houses burned down in Tenerife and 60 in Gran Canaria lead to such average minimum figures? Why was nobody reporting on how many a holiday home in Tenerife had been destroyed or damaged by the wildfires? That question is easy to answer. Why? Many holiday home owners are not permanently in the Canary islands. Many foreigners in Tenerife only spend winters there. Young people often prefer holiday accommodation near Tenerife's beaches. That's why, overall, many holiday homes in Tenerife are less occupied in summer. Foreigners also often don't speak Spanish. It would be difficult for them to contact local authorities in cases of emergencies like the wildfires in Tenerife. "Some (10-15) endemic Canary plants face extinction danger because of the wildfires in Tenerife. A very rare finch being the most vulnerable...", my neighbor with Jaco the parrot told me. Indigenous plants do indeed recover faster than expected, especially the Canary Pine. My friend Lourdes who studied botanic sciences in Bolivia told me that something inside the pine helps the tree survive fire. Perhaps I misunderstood. Perhaps its the resin of the tree that preserves it better. I agree with my friend by personal experience gained with South African wildfires and, endemic plants over a period of almost 20 years. Endemic flora and wildfires. Tenerife pines and Laurisilva will not disappear, by the way . There was much talk about building an emergency assistance set up for the Canary Islands in the Canary Islands media. Wildfires in Tenerife are not the only threat. Later it was confirmed by Tenerife's Cabildo President Mr. Melchior that 150 soldiers would be permanently placed on disaster assistance stand-by near Los Rodeos in Tenerife north which became reality on 25th of March 2008 as reported by El Dia Newspaper at that time. Finally, Tenerife received its own EMU (emergency unit) which arrived at Los Rodeos airport where however a unit of only 77 members will be stationed on stand by. What is remarkable is that Señor Salvador Garcia who presented the unit to all relevant island dignities spelled out that the unit may be ordered to help in all kinds of emergencies by not only the Spanish government - which by the way set this all up with a cost of Euros 4 million - but, also by the Tenerife 'Cabilde', municipalities and likewise authorities. A similar idea about such a set up had come up after the floods in the Tenerife capital Santa Cruz. However, manpower for physical assistance on standby might not be good enough. A strong co-operation with neighboring countries including mainland Spain should be agreed upon, beforehand. Those are simply my own humble feelings. Mainland Spain Government also assured Tenerife as well as Gran Canaria of financial help for all the people that suffered economic losses due to the fires. I would think that the Canary Islands of La Gomera and, El Hierro where loss due to fire was later confirmed will not be excluded. 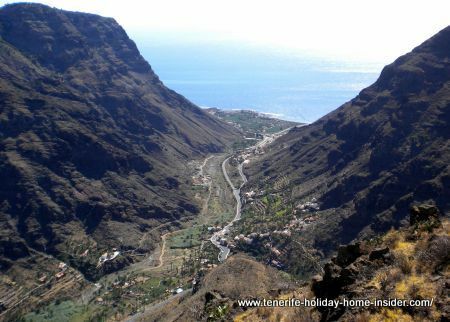 Please, note that tourists that have planned a holiday in Tenerife in coastal hotels may not worry about their safety regarding fires... Coastal roads in southern Tenerife below los Gigantes had been open all the time. That alone, speaks for itself. The same applied to the north of the island. I could finally get hold of my friend in Los Gigantes. He could travel down the coast from Los Gigantes during all the days of the wildfires in Tenerife without any fire threat. People who are concerned about fires may also care about wildlife and animals on land and in the sea in Tenerife Spain. Why La Gomera which is part of the Province of Tenerife was hit so much harder by fires Here what it looked like in the autumn of 2014. Valle Gran Rey with all its banana plantations and endemic palms looked well recovered from the wildfires in 2014. However, I was shocked to see how much vegetation in the outskirts of the priceless Garajoney by the roadside only just started to regrow. In fact, much of the Laurisilva still looked scorched by the edges of the ancient forests, two years after the disaster. By the way, more than one local person said that those Gomeran fires had not been wildfires.